Almost the perfect piano, now at a more attainable price. Highly versatile and expressive. Very realistic sound. Well-priced add-ons. Seriously comprehensive editing options. A few more ambitious presets would be nice. 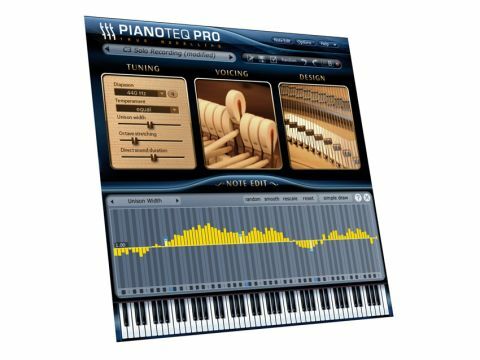 When Pianoteq 3 was launched back in early 2009, we gave it an impressive four-and-a-half star rating for its tiny hard drive footprint, incredible versatility and deep, rich piano emulations. So, for a product that has already been given almost the highest score it can achieve, and without a full figured update, why return to it at the grand old age of 3.6? Good question, and a quick visit to Modartt's website should begin to give you the answer. Over the past year and a bit, Pianoteq has seen some notable updates, in the form of the traditional add-ons it's seen since its inception, but also a new cut-down version known as Pianoteq Play. Before we move on to the new features, let's take a quick look back at Pianoteq as a whole. While multi-GB sampled piano libraries are in abundance, Pianoteq takes the physical modelling approach. This isn't just to limit the impact on your hard drive but also to offer comprehensive flexibility in the form of five adjustable microphones in a virtual space, note-by-note editing of tuning, damper position, strike point etc, tweakable hammer hardness, mechanical noises, string length, unison width, grand piano lid position and a lot more. While these modifying options are well implemented, there's just as many musicians out there who will never touch these features and are simply after a fantastic sounding, easy to use, accurately-priced virtual piano. Enter Pianoteq Play, a slimmer version of Pianoteq, ditching the heavy editing functions but maintaining the piano library, effects such as Reverb, Tremelo and Limiter as well as the standard EQ, velocity and pedal response curves, while cutting the price from 249 Euros (Pianoteq PRO) to a clean 99. Even better news is that Pianoteq Play is also eligible for Modartt's free add-ons such as the Yamaha CP80 as well as the commercial additions in the form of Clavinet, Rhodes, Wurlitzer, Vibraphone, Celeste, Glockenspiel and Rock Piano, ranging in price but starting at 29 Euros. All good then, in terms of choices and modular options. But what of that aforementioned Pianoteq sound? If you don't love Pianoteq for its tiny file size (roughly 21MB), serious flexibility, ease of use or low CPU impact, love it for its sound. Pianoteq is one of the most responsive, beautiful and delicately modelled pianos you'll play. It can be as big and bold or soft and subtle as you need it to be, even before you dive in to any mic repositioning or hammer adjustments. If we were to criticise Pianoteq, it wouldn't be for the sound as much as it would be for the presets. While they cover a lot of different studio and live scenarios, due to the thorough editing options, it'd be nice to see some more 'experimental' presets, showcasing how far you can travel from the traditional piano sound in just a few adjustments. Also, if you're making dance or house music, this piano sounds real - very real - so if it's the classic Korg M1 piano you're after, you'll probably have to spend some time reigning in the reality of the emulation, which kind of misses the point. The fact remains that, once you sit down and play Pianoteq, its in-depth editing options, add-ons, presets and even interface become a second thought to the responsiveness, detail and nuances in the sound it produces. This is truly a player's piano, and you will get lost in its intricacy.